Hey, guys! I hope all is well with you and yours! A while back I mentioned that I wanted to do a Goosebumps read through. I loved the Goosebumps books growing up and I felt like it was time for a re-read. Instead of picking my favorites and reading them first, I decided to start at one and read my way through in order of publication. Welcome To Dead House is the perfect starter book for fans of R.L. Stine! It has all of the classic haunted horror tropes that you expect, but there is always a twist with R.L. Stine books. The Benson Family inherit an old free house from a distant relative that they never knew they had. Amanda (12 years old) and her brother Josh (11 years old) move with their parents to the old house. They bring their dog Petey along with them. The old house is located in Dark Falls, which can’t be good. Things start happening around the house and neighborhood. The ending is classic and creepy! 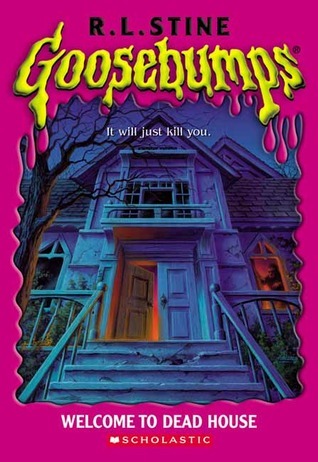 Welcome to Dead House is filled with spooks and chills that I remember from my youth. I can’t wait to read the next book in the series! Until next time, horror fam! I highly recommend this book to fans of horror and haunted houses!